Blowout Sale! Save 71% on the TINGOX Wall Mounted Coat Towel Hooks, Metal Heavy Duty Swing Robe Rack Hanger, 45 lbs Weight Capacity with 6 Utility Hooks, Best Decorative for Bathroom Cubicle Entryway (Oil Rubbed Bronze) by TINGOX at tradingmart.net. MPN: TX001-B. Hurry! Limited time offer. Offer valid only while supplies last. Product descriptionTired of clothes and hats in a mess? Tired of poor quality or vulgar design of other coat hooks? TINGOX clothes hook helps you. Tired of clothes and hats in a mess? Tired of poor quality or vulgar design of other coat hooks? TINGOX clothes hook helps you. Our designers consider its practicality, beauty and durability on the basis of market research from a lot of people. 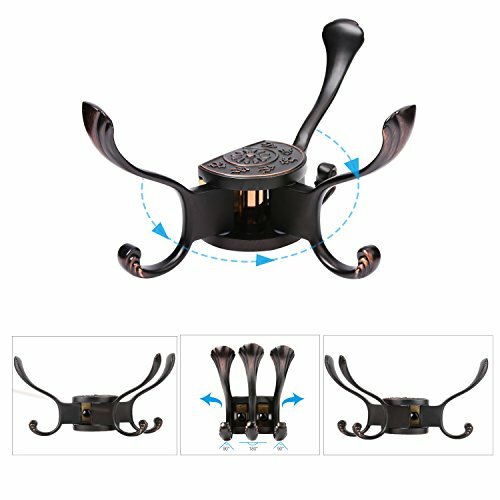 It has thickened heavy duty metal, pretty cool design with 3 rotating arms and 6 hooks, and of course easily to be mounted into wall. Using this hook shows that you have a good taste while helps you to keep things orderly. If for any reason you are not 100% satisfied with the product, we will refund your money, no question asked. Conveniently to be mounted into wall. Find a solid place and drill two holes with a 6mm drill. Insert screw plastic expansion tube(plug) into the predrilled holes. Mount metal base into wall using a screwdriver, then cover screw heads with two small caps. Insert hook body into the base. Tighten hook body using the hexagon wrench. Please be careful when using a screwdriver. Don't hurt yourself. The hexagonal screw that tightens the hook body is very small. Please pay special attention, it may be difficult to find if you drop it. The metal base of the hook should be mounted into solid wood or other solid places, otherwise weight capacity won't be that better. Please loosen the big screw on the bottom of hook body a little bit if it's diffcult to insert hook body into the metal base. Adjusting the tightness of the bottom big screw could increase or decrease the resistance of arms. STYLISH FINISH - Elegant cool modern rustic look with 3 swivel arms, even the screw head covered with a specially designed cap, show your unique and personalized taste to your friends. EXCELLENT INDUSTRIAL DESIGN - Made of 13oz heavy duty thickened Zinc Alloy, durable, smooth and corrosion resistant, will not get your things damage or dirty. Specially consider bending angle to avoid things slipping off, perfect solution for organizing coat, sweater, robe, purse, umbrella, baseball cap, scarf and dog leash. LESS SPACE OCCUPIED - Triple folding rotary arms help you save more space than others, but still can hold more things due to its 6 hooks. Classic style coordinates with most home decorations and ideal for use in cubicle, bathroom, bedroom, entryway, garage, kitcken, hallway and foyer. EASY TO INSTALL - Mounting hardware and TINGOX installation instructions included, easy to install. QUALITY GUARANTEE - TINGOX is a registered brand in US which provide lifetime warranty with assurance of refund. To ensure the quality, please note our brand. This item ONLY fulfilled by Amazon and seller "FredyDirect" store. That will be different item if offered by other sellers in this listing. If you have any questions about this product by TINGOX, contact us by completing and submitting the form below. If you are looking for a specif part number, please include it with your message.